We want to make our Beam-chain as cool as possible, so let's start by going to Assets > Doodads. Scroll down to Temple Column > TempleColumn_17.m3. Double click it and check out this awesome doodad that will soon be our tower of death. It is important to note that it doesn't have any attachments, so we will be restricted on where the lightning originates: the ground. However, we can create a workaround by applying a Site Operator to the beam's actor causing it to shoot from a height above the ground. If this bothers you, choose a structure model with attachment points. Now that we have our desired model, let's pick out some effects. I decided to use MothershipPhotonBeam.m3 as the first attack, NullifierBeam.m3 as the 3 bounce attacks and DetonateImpact.m3 as the final AoE. Keep track of the models you chose unless you're going to follow along with me. Close the Previewer and open the Data Editor (F7). From here on out I'm going to short hand as much as possible. I could fill several pages with heavy details, but for the sake of brevity I'm going to expect you to have intermediate knowledge of the Data Editor. If you DON'T, you should probably start with other tutorials before reading this. You may be tempted to mess with sizes and so for, but don't. This is your generic model. We will use actors to change anything and everything we want. This prevents redundancies. For whatever reason, the last buff in your chain must apply it's effect at the end of its period or it won't register at all. It doesn't change a whole lot mechanic wise other than that you have to remember this or you'll find yourself 1 beam short. In our case it would mean no AoE splash either and we certain don't want to lose our big explosion! The best part is you can even use Search Target Sorts to pick units with the lowest health % first. Your buff could even add a HoT to boot! Now imagine using missiles to achieve the same thing. . . . nightmare! These will prevent your buffs from stacking. These will prevent your search effects from picking units hit earlier in the chain. 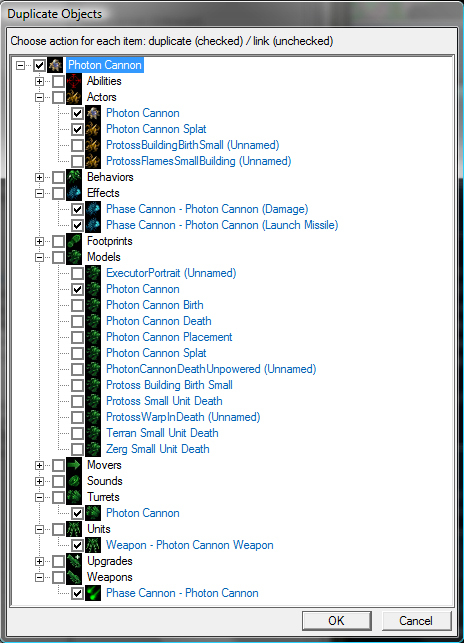 Start by swapping the Photon Cannon model under the actor with Beam Tower, the model we created before. Go on to rename the actors Beam Tower and Beam Tower Splat, the turret Beam Tower and the weapon Energy Salvo ("Beam Tower -" in the Editor Prefix field). Now delete any abilities, command card buttons or behaviors you don't want and decide on your structure stats (HP, armor etc). Now all we have left is our actors. You should notice that all of your effects are now linked to your unit. You can test it and shoot it, but you won't hear anything and you certainly won't see anything other than units taking damage. If you use different beams, make sure they actually have a "Stand" animation to put in "Animation Properties" otherwise they still won't show up. Also, "Time Type:" is how you can control your animation speed. Duration sets the animation to the exact Time Variant while Time Scale applies the Time Variant as a multiplier. This actor will make sure your bounces connect with the targets and originate from their center so that you don't have strange looking beams. This actor will allow your structure to "turn" to attack units. Without this, some structures can't attack at all. With that, you now have a working Beam Chain Tower with an AoE Splash finale! I've attached a test map as a reference. I've also attached a 2nd map illustration a Beam Burst in which a unit fires a beam at a target and then beams fire out from that target at surrounding targets. If you've played red alert, think of the "Prism Tank." If you have any questions or concerns you can try here or on the IRC room where I'll be hanging out whenever I'm online and in the editor. Interesting approach using target sort instead of markers. I've implemented chain lightning a couple of times and usually I set the Marker ID enabled flag under the weapon (or ability) and then add a (No Markers) validator to the damage effect. It requires creating a few less objects that way. However, the target sort approach is interesting, and I've been looking around for someone who got them to work correctly, so good job. With Marker ID, you can't have two lightning chains hit the same unit . So you're able to achieve the following with your Marker IDs? Apart from that, very good! I've never used target sort before (I've barely used the data editor at all) but I can say I've learned something new. "These will prevent your search effects from picking units hit earlier in the chain." If you just want to make it so it'll always jump to the same unit, but can jump to a unit which was previously hit early in the chain, you don't need target sorts or markers at all, all you have to do is edit the Exclude field in the Search effect and add Target to it. And Riley, you understood what I meant in that quote correctly. The Target Sorts are to prevent any unit from being hit multiple times during a single chain of attacks. My understanding is that with Markers you either have them "On" and you're not able to hit any target more than once or they are "Off" and it's a FFA in terms of what gets hit. With Target Sorts you don't have the either or. You can have it bounce to unique targets, bounce to the targets with the most/least % health etc. Okay I think I see what you mean now, you want it so that it'll prioritize units that haven't been hit yet when searching for new targets to bounce to, but if there aren't any than it can bounce to a unit it's already hit. In that case target sorts are a clever way to go but you might want to clarify how the effect works since the sentence I quoted above seems to imply that the attack should never bounce to the same target more than once. In the tutorial, it works exactly as you first thought it did. The Target Sorts being used require unique targets so my sentence is accurate. However, when you brought up Markers (another great way to make chains), I was pointing out that I used Target Sorts instead of Markers because it is the most dynamic way create an adaptable beam chain. I included behaviors, validators and target sorts so that anyone who uses my tutorial can make their beam chain do just about anything they can imagine. It's far more complex, yes, but that was done on purpose as this tutorial is aimed at experienced users who are struggling to get a beam chain that does what they want. With your damage effects having Location+ linked to the previous search. Then you can quickly enable Marker IDs and add the "No Markers" Validator. Alright I see what you're saying now. Good job on going the extra mile then. Also the AoE disappears too fast. Its just a split second and then gone.. I assume you used this, but have a different explosion. With automatic it bases it's animation time on the models actual scene length (time from start to finish). So if it's only got a length of 0.5 it's going to explode and disappear very quickly. You can fix this by changing the Time Type: to Duration and setting the exact time you want with Time Variant: If you don't want an exact time use Time Scale and it will apply a multiplier to the scene length. This is more touchy though as you need to know the length ahead of time. Duration gives you exact control. I am having some problems though. I followed your instructions as accurately as possible, but the beam animations don't show up. I've tried to recheck the fields for the actors but the few differences I did find between my map & your test map didn't accomplish anything. Also, how come there is no final AoE against Zerglings? There are a few reasons why your beams might not be showing up even if you have the same actions and events (though I recommend double checking). 1) If you didn't set the "Launch Locations" on the Damage effects correct, you'll end up with the beams being told to start from the point where the damage launches (it's target) and end where it lands (its target as well). This makes your beams become dots which usually don't show up. In some cases you might see little flashes of light which hints that this is the case. 2) If you failed to put a search on the first buff or the apply behavior in the first set, the entire chain will be unlinked from the attack. This is a very easy mistake to make given how many effects you're trying to link together. It's always a good idea to walk through the chain from beginning to end by physically clicking on each field and seeing what it points to (target) and where it points from (launch). 3) Another common mistake is to use the same Animation Properties as I did with different beams. For example, some beams only have Birth and Death or even just Stand. In this case if I say to use Death but it doesn't have that animation, it won't show up. This just gets worse if you used the same beam for multiple bounces. Check your animations in the previewer to see if they actually have the animation variation you're telling the actor events to create. Tried to make this an ability and failed miserably. I called the ability Destruction gave it a range of 9 and set the effect to "Beam Bounce 1 Set" . Do I need another effect to make the ability work correctly? I have narrowed it down to the ability starting way up high like 5 (virtual) feet above the character. This makes its range MUCH shorter. I can sit there and attack myself with it but it will rarely attack anything else. Prozaic, I believe the buff approach is flawed. From what I understand, your chain applies .5 second duration behavior. But if multiple cannons are firing at the same targets, then they will get confused with each others' behaviors and not fire appropriately. Correct me if I'm wrong, but as far as I know, there's no way to check the source of a behavior in a separate ability, especially on a separate unit. Instead, you might be able to use the "Exclude +" field in your searches to exclude the target of the previous chain effect.